Inventory We are a resale marketplace, not a box office or venue. Ticket prices may exceed face value. This site is not owned by DCU Center . The DCU Center, formerly known as The Centrum, Centrum in Worcester and Worcester's Centrum Centre, is an indoor arena and convention center complex located in downtown Worcester, Massachusetts. The facility hosts a variety of events including concerts, sporting events, family shows, conventions, trade-shows, and meetings. 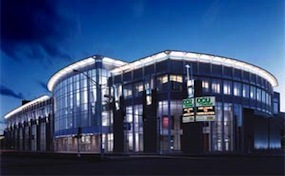 The DCU Center is owned by the City of Worcester and managed by SMG, a private management firm for public assembly facilities. The naming rights were purchased in 2004 by DCU, Digital Federal Credit Union. Opened in 1982 after a series of construction delays, the DCU center had a seating capacity of 12,000. The arena was expanded in 1989 to add 3,000 more seats. In 2009 the stadium was upgraded and these included: a new electrical system, new ice chillers, and a completely new ice floor for hockey season. All of these were original to the stadium since 1982. 2012 provided another wave of upgrades for the facility. These included a dehumidification system, improved heating and air conditioning, renovated restrooms and concession stands, and a glass wall on the Foster Street side of the venue. CenterWorchester.com is not affiliated with any primary box office or supplier. We are a privately owned and operated business specializing in sales in the secondary market. To buy tickets for any DCU Center events in Worcester simply click on the event of interest or call our operators at anytime.